GOES magazine (www.goesmagazine.org) provides the opportunity for science students to get involved in publishing and not only writing articles about their research, experiences and scientific fun facts, but also seeing how editing, proof-reading and designing is done in real time. 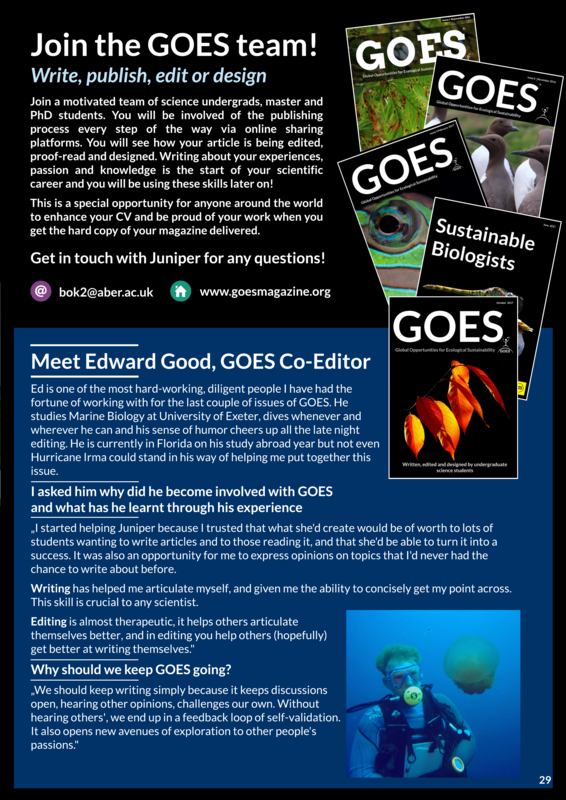 GOES stands for Global Opportunities for Ecological Sustainability and each issue has a wide range of topics in science, conservation and sustainability from ‘Meteor 117 – 26 days of sea surface sampling’, ‘Designing future crops with micro-CT scanning’, to ‘A complete fruit case- attempting to set the record straight on banana spiders, spiders in bananas and bananas in journalism’. GOES was started up in September 2016 at Anglia Ruskin University (Cambridge, UK), and since then, five issues have been published. Articles are edited and designed within 24 hours on online sharing platforms (GoogleDocs and Lucidpress) after receiving them which shows students how quick and easy it is. Each article has to have a minimum of three primary peer-reviewed references. One form of the articles is ‘Personal Experience’ (e.g. volunteering, studying) which is up to 700 words and the other, slightly more formal ‘Scientific Article’ form, which can be up to 1,500 word long. The articles are proof-read by more experienced students and academics and the writers are encouraged to edit their articles according to these feedbacks. Before publishing, all writers receive the final version of their articles and it is not published until every author has approved their work. The open-access online edition is published on the website (www.goesmagazine.org) and 150-250 hard copies are printed by an environmentally friendly company. From the June issue, all hard copies are printed with Whitehall Printing, an FSC certified company that uses 100% recycled paper and vegetable ink. The writers receive hard copies for free and after our first year, the writers had the opportunity to design their own business cards, printed by MOO, a company that recycles scraps of T-shirts for their cards. Sustainability is the very core of the magazine. The main aim of starting up GOES magazine was to make the experience of publishing for students motivational, show them their work in print and distribute them at their universities so they can be proud of their work. The hard copies are also great conversation starters at conferences and job interviews that let students stand out without having to go to Costa Rica to volunteer in turtle conservation or pay for expensive courses and certifications. As there is an increasing number of problems in conservation, policy making and science funding, my generation will not only have to be hard-working and determined. We also need to have the ability to get the public on our side, and be able to explain our findings, research and knowledge to a wide range of people, from politicians to farmers in developing countries in the right way. Amazing papers in Nature and Science also need to be ‘translated’ to non-scientists to make sure that impact factor is just as high outside, as it is within the scientific community. By getting involved with publishing from the first year of undergraduate studies, we would not have thought how much we would gain from this experience. But as publishing is ‘just for fun’ in GOES, it gives the confidence for students to write more, speak up more and without noticing, we are becoming the new generation of scientists, passionate about communicating our work to others. Over the last year, we have raised £3,500 for the magazine from the Big Pitch business competition, the Andy Wilson Bursary at Anglia Ruskin University (Cambridge, UK), donation from Texas Tech University (Texas, USA), and from the Global Sustainability Institute’s (Cambridge, UK) Be the Change grant. Thanks to these funds we were able to publish these 5 issues both online and in print as well. The ‘Be the Change’ grant from the GSI was used to run a science communication mini-module where I gave weekly presentations and three computer practicals to my classmates with my lecturer Dr Alex Dittrich. 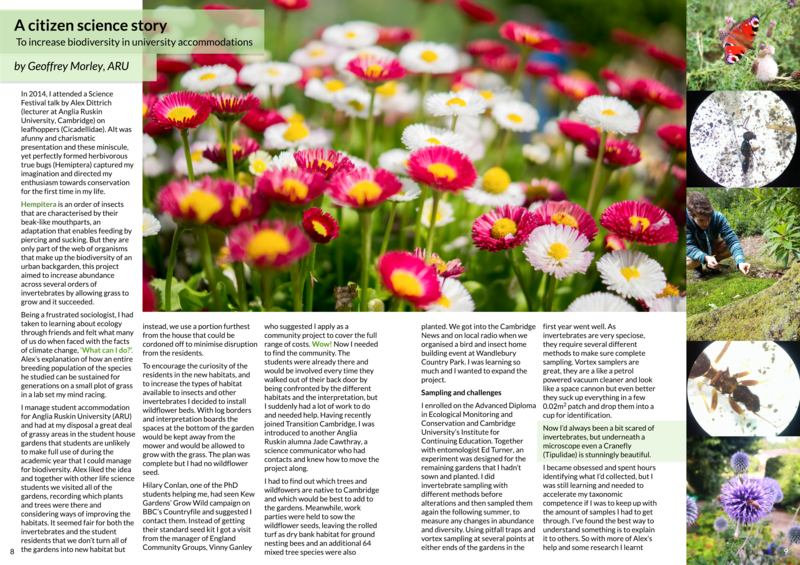 The end product of this project was the ‘Being Sustainable Biologists’ June issue of GOES written entirely by Anglia Ruskin students and the writers were surprised with extra funds to design and print their own business cards for future networking. We are a team of highly-motivated students, working together to support each other, and learning as we go along and get more students to join our community. Last summer I lived in a tent to save up the money to cover the printing costs of the very first issue and had the opportunity to show the second issue to Dennis Dimick, the Executive Editor of Environment – National Geographic Magazine. Thanks to his feedback, we learnt a lot about graphics and the importance of titles! As all the editing and designing is done via online sharing platforms, we have people from different continents and not even hurricane Irma could get in the way of editors to proof-read articles for the latest October issue (pp 29, October issue). We continue promoting GOES at different universities to encourage students to publish and build up a great community of motivated science students. We also hope to keep on raising funds so no paid marketing is needed for the magazine and we would like to start paying students to actually go to conferences, to travel and write about their visits. If you are student, please get in touch and within a couple of days, we will have your article ready – no experience needed! 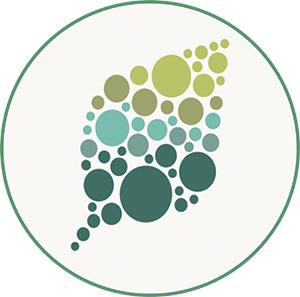 Even if you have no idea where to start and what topic to choose, we will have a chat and you will have someone to talk to every step of the way. If you are scientist at a university or institute, please help spread the word of GOES and encourage your students to take part! We are also always looking for academic proof-readers to check our work and get feedback on our writing skills. You can also support the magazine by either helping with designing, marketing, donations, buying hard copies or sharing our posts on social media. We look forward to getting more people joining our team and working together!